Spiky red-haired villain! 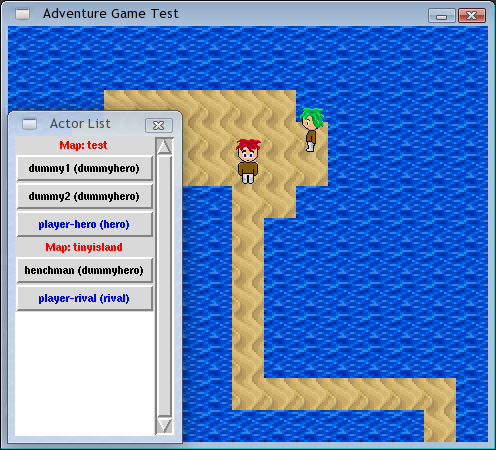 And the debug-mode actor selector window. I made some new character sprites (the ones pictured are temporary. I created a template spriteset and then hurriedly threw these guys together so I wouldn't have to show naked sprites in the screenshots). The engine supports multiple heroes now (the blue and red haired guys are the singleton heroes), and multiple maps (each of the singleton heroes are on different maps), and it keeps track of what's happening on each map at all times. Next on the to-do list: teleporting between maps (and when a singleton is the last one to leave a map, the map gets purged from memory and non-singletons left on it are forgotten about and reset if the map gets reloaded in the future), and animations. After that: on-screen text and dialogs. Then shortly thereafter there will be a public alpha release of it that you can mess around with. 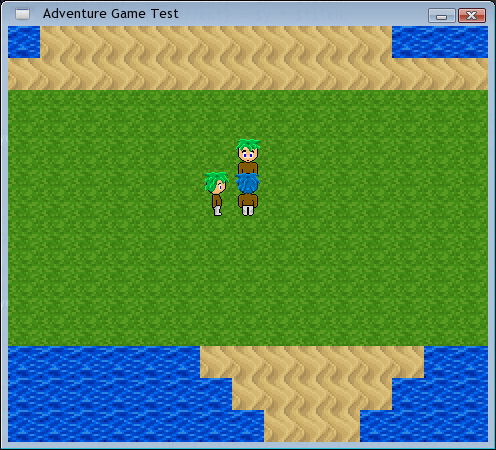 See other blog posts about my game engine: KAGE.